Look Away, Dark Souls Fans. Just Look Away. GameStop and Bandai Namco would really like you to preorder Dark Souls III. They made a mobile game about it called Slashy Souls. Want to play it? I wouldn’t bother. Despite the gif above being pulled from Polygon’s direct feed video of Slashy Souls in action, I did bother to download the free GameStop published iOS and Android game this morning and give it a go. Something felt off from the startup screen. The feeling of unease only grew once the title screen loaded. The feeling subsided briefly during gameplay. 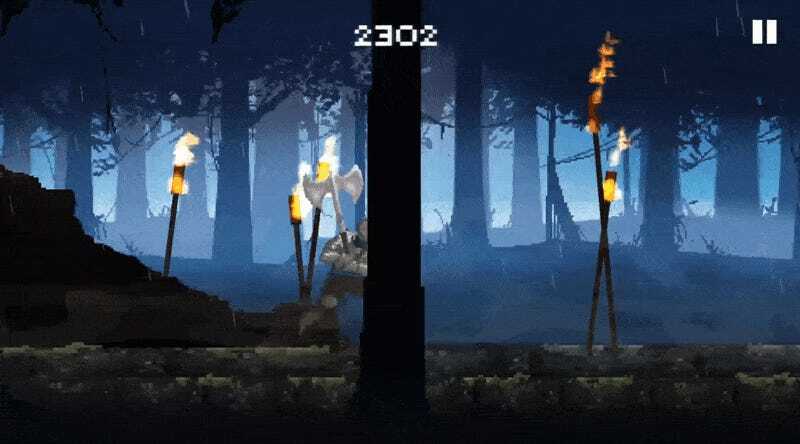 Slashy Souls is a runner game featuring 2D pixel renditions of series villains, traps and equipment. There are no instructions, no on-screen prompts. It’s a figure it out for yourself sort of game. If you want a richer gaming experience with deeper combat and basic tutorials explaining how to do simple things, then maybe you should preorder Dark Souls III at GameStop. Oh god. They got to me. Help me Luke Plunkett! So far my favorite part of Slashy Souls was the bit where the game crashed and the screen went all pinkish purple. More pink than anything, I guess. The rest of the game feels a bit markety. Slashy Souls is now available on iOS and Android. You really shouldn’t.